1. 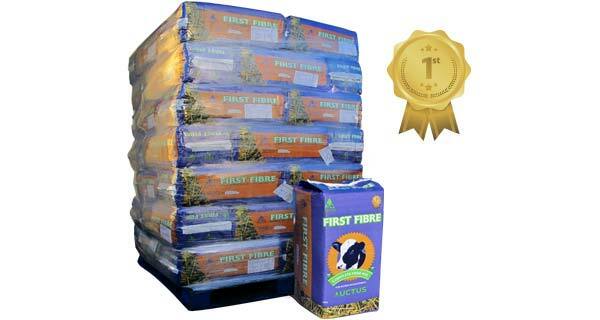 FIRST FIBRE is uniquely formulated to vastly improve the Rumen development process in the first few weeks of life. 2. FIRST FIBRE is a complete fibre mix of three sources containing: Lucerne; first generation Timothy Grass; and dried Straw to improve Rumen gut wall integrity, papillae growth and the development of primary enzymes. 3. An extremely palatable, high protein ration coupled with a balanced Vitamin, Mineral and Amino Acid inclusion gives superior efficiency and absorbtion of nutrients. 4. With chop length of less than 5cm, the necessary scratch factor is provided and in turn papillae are stimulated to develop in the Rumen. 5. Contains prebiotics to maximise gut health as the animal establishes the correct microflora/bacteria populations. 6. A very low moisture content is achieved due to the unique manufacturing process, which means there is no risk of secondary fermentation or mycotoxin build up, even in an open bale. 7. Each bale is sectioned in approximately 2kg slices to: firstly, make the measuring of intakes extremely easy and accurate; and secondly to keep each section compact and totally fresh. 8. Feeding guidelines of 1-2 bales of FIRST FIBRE per calf during the rearing period. 9. Long shelf life achieved of 12 months from date of manufacture. 10. Can be fed alongside your preferred concentrate. 11. Available in pallets of 20kg heat sealed bales. To download FIRST FIBRE product information, click here.